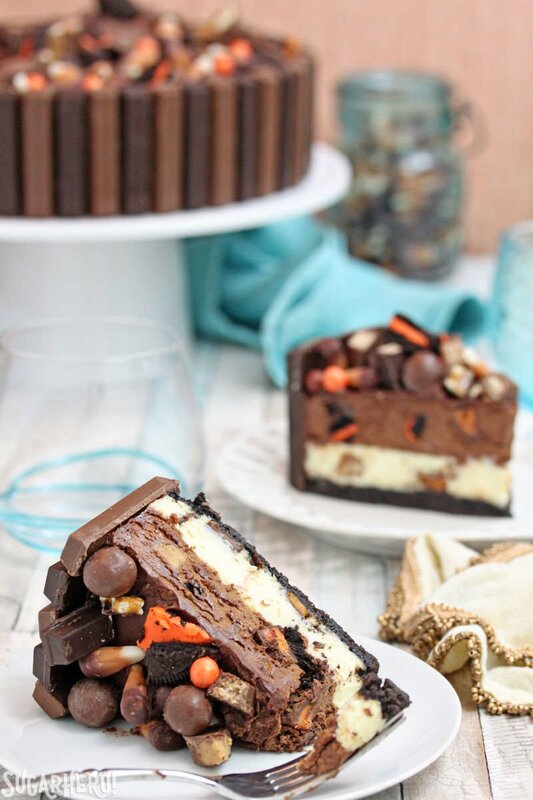 This Candy Bar Cheesecake has it all! 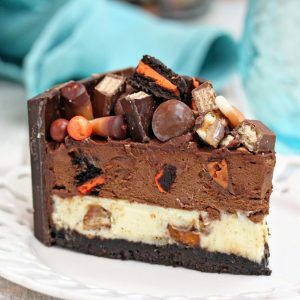 A crunchy chocolate crust, two flavors of cheesecake, and LOTS of candy bars mixed in and on top! 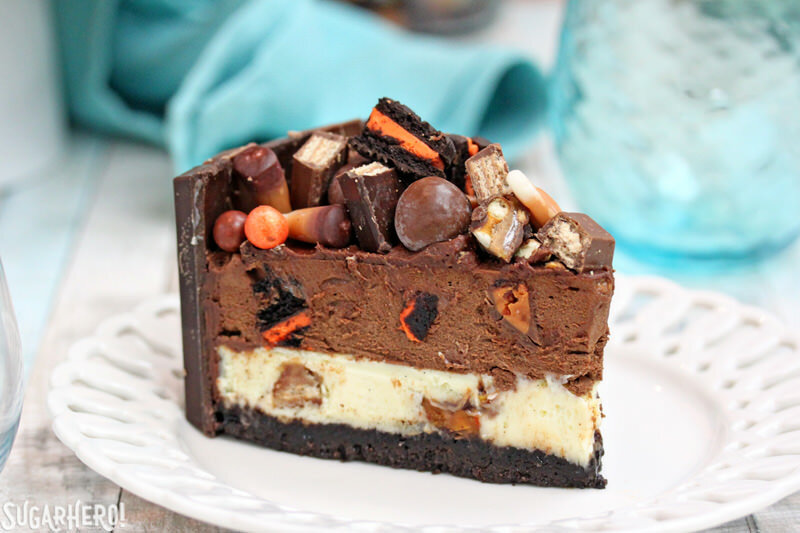 Use all your favorite chocolate candy bars to make this epic cheesecake! Welcome to the days after Halloween, or as I like to call them, “Major Regret.” Sure, buying that extra-jumbo-hugenormous bag of Halloween candy bars always SEEMS like a good idea at the time…until it’s three days later and you find yourself covered in smears of chocolate and a blanket of empty wrappers. This cheesecake is a beast, in the best way possible. 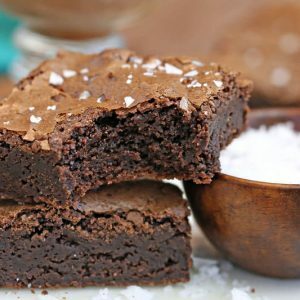 It starts with a crunchy chocolate crust, made from Oreos + butter. I used Halloween Oreos, but any flavor/variety you have will work well. The filling is a double-decker beauty, half chocolate and half vanilla. I stirred chopped candy bars into the filling as well. Any candy bar should work, but my personal favorites were any with caramel (Snickers, 100 Grand, Milky Way) and Reese’s peanut butter cups. 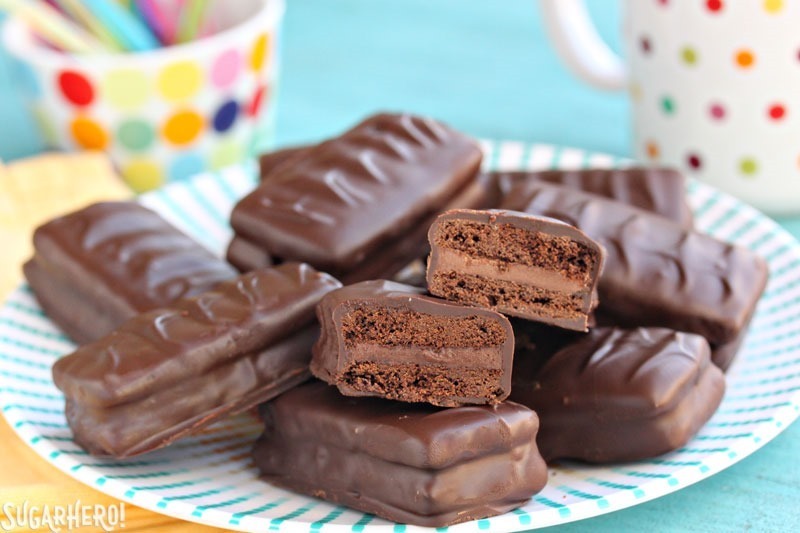 The only ones I DIDN’T like were malted milk balls–their texture got a bit odd and chewy after baking, so if you have any Whoppers or similar, I would recommend using them as a topping only. 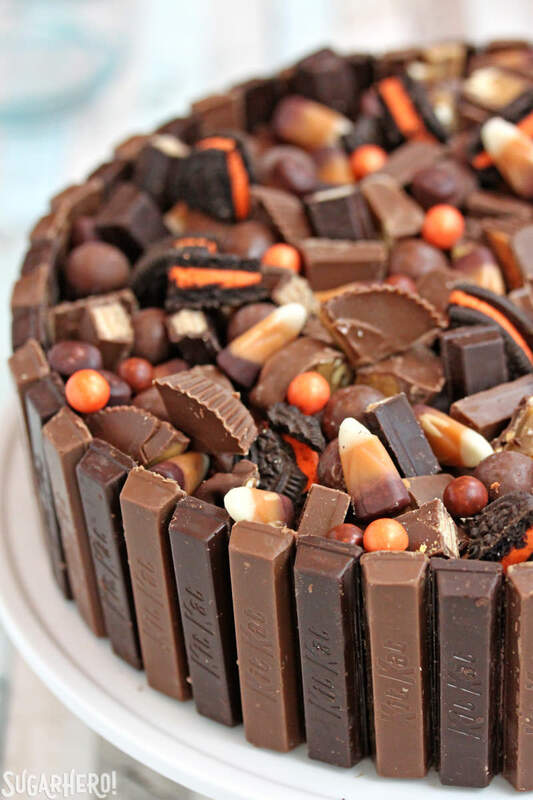 After the cheesecake is baked and cooled, I finished it off with a ring of Kit Kats around the edges, and a topping of more candy and Oreo cookies. 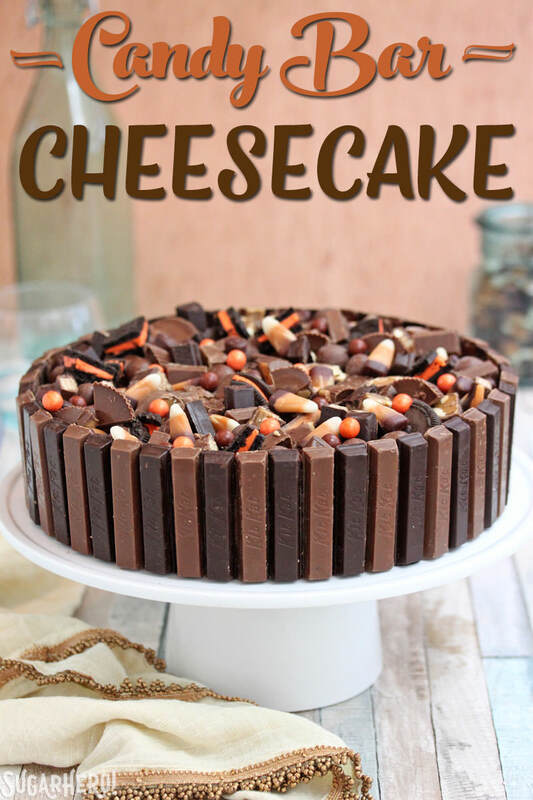 Both of these elements are optional–if you have extra candy and Kit Kats, knock yourself out, and if you don’t, this cheesecake is already plenty decadent and rich just with the candy in the filling! You might notice that I added some candy corn on top of the cheesecake too–I didn’t throw them in the batter to bake, because I thought the texture might suffer, but as a cheesecake topping, they’re perfect. I also added a few orange Sixlets for some color, just to break up all the drab browns. Chocolate may be delicious, but it’s a little lacking in visual excitement. 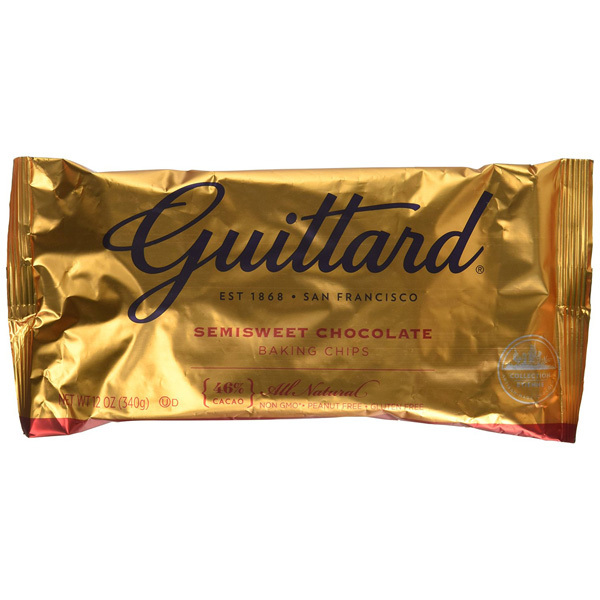 Are you suffering from extra candy regret too? I’m always looking for fun candy ideas, so let me know what you like to do with your Halloween leftovers in the comments! 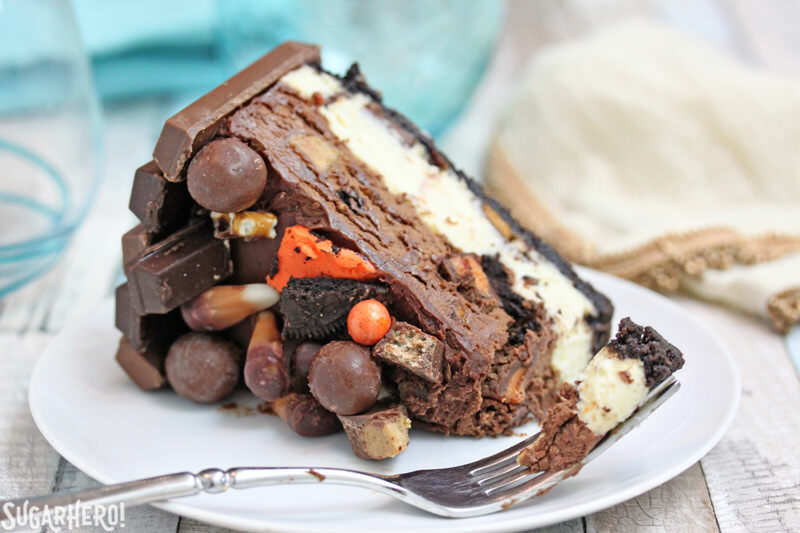 This Candy Bar Cheesecake has it all! 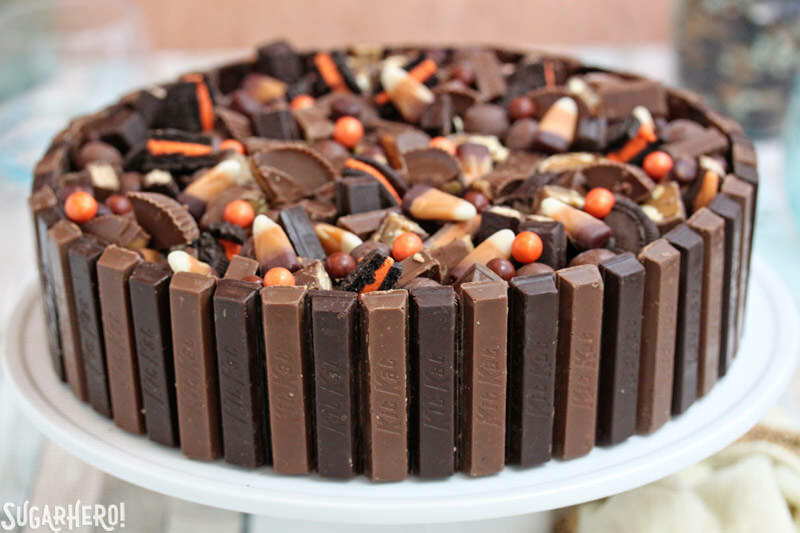 A crunchy chocolate crust, two flavors in the filling, and LOTS of candy bars mixed in and on top! You can use any chocolate-based candy bars you have on hand to make this cheesecake. Please note: While the actual making of this cheesecake is a minimal time commitment, it does need to bake for almost an hour, cool in the oven for an hour, and chill overnight before it is served, so make sure you plan your time accordingly. Preheat the oven to 350 F. Start heating water to a boil, for the water bath. 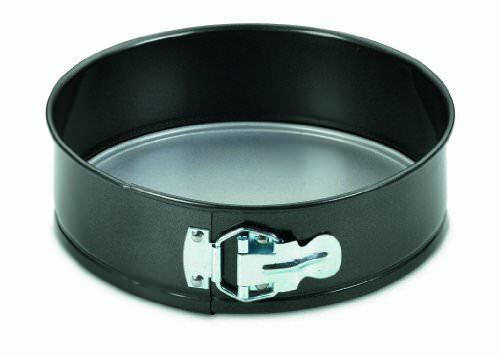 Spray a 9-inch springform pan with nonstick cooking spray. Wrap aluminum foil tightly around the outside of the pan, coming up to the top edge. I like to use heavy-duty 18-inch foil, to prevent any water from leaking in to the cheesecake, but if you don’t have 18-inch foil, consider doing 2 overlapping layers of foil to make it more waterproof. Alternately, you can use a disposable foil cake pan, and cut the cheesecake out of it after baking. Combine the melted butter and Oreo cookie crumbs , and stir them together until the crumbs are the texture of wet sand. Firmly press the chocolate crumbs into the bottom of the pan—no need to press it up the sides. Refrigerate the pan while you prepare the filling. Place the room temperature cream cheese in the bowl of a large stand mixer fitted with a paddle attachment. (A hand mixer can also be used.) Beat the cream cheese on medium speed until it is fluffy and free of lumps. Add the sugar and mix it in, then scrape down the bottom and sides of the bowl well. Divide the cheesecake batter in half, and stir the melted semi-sweet chocolate into half of the batter. 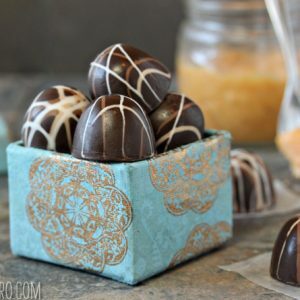 Add about ½ cup of chopped candy bars to each color. Scrape the plain batter into the prepared crust, and smooth it into an even layer. Pour the chocolate batter on top, and smooth that as well. Place the pan into a larger pan and pour boiling water into the larger pan until it comes halfway up the side of the cheesecake pan. Release the sides of the pan, and run a thin metal spatula under the crust to remove it from the bottom. Transfer the cheesecake to your serving plate. Spread a thin layer of chocolate frosting around the sides of the cheesecake, and press the Kit Kat bars into the sides all the way around. Spread the remaining frosting on top of the cake in a thin layer, and sprinkle the top with the remaining chopped candy bars, pressing them gently into the frosting to adhere them. Slice, serve, and enjoy! Oh my word this is cake looks ridiculously good. Oh, wow! I don’t think I’ve ever seen a more delicious looking cheesecake! THIS is my kind of cheesecake. 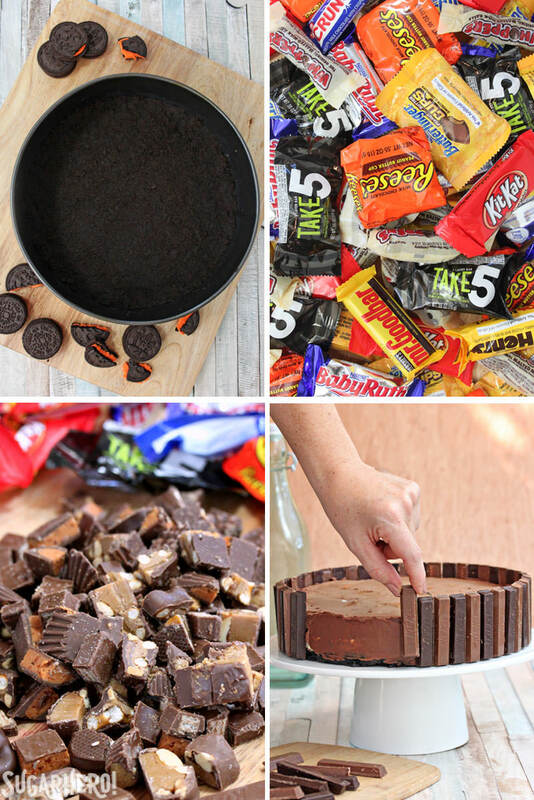 What better way to put that leftover Halloween candy to use than this! ?